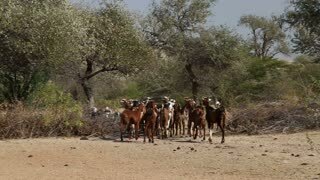 Search Results for "young cattle"
JODHPUR, INDIA - 13 FEBRUARY 2015: Young cattle keepers standing by cattle lying at field in Jodhpur. JODHPUR, INDIA - 13 FEBRUARY 2015: Young cattle keepers leading the cattle down the field in Jodhpur. JODHPUR, INDIA - 13 FEBRUARY 2015: Portrait of young cattle keepers at rural road in Jodhpur. Young Longhorn Cattle in a field. A young, brown Asian Bull approaches the camera. Known as 'humped cattle' or 'Indicus cattle'. Taken in Thailand. 1970s - Navajo cowboys wrangle cattle; a young boy tries to lasso. A young, brown, tethered Asian Bull stands next to a trough. Known as 'humped cattle' or 'Indicus cattle'. Taken in Thailand. Highland cattle feeding its young calf in farmland, Germany. Highland cattle feeding and cleaning its young calf on farmland in Germany.